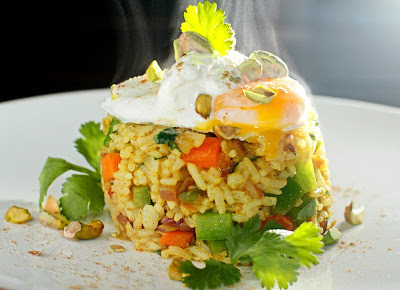 This is a kind of oversimplified version of biryani, but it works because the result is fantastic. If you'd like to get crazy with it, a handful of golden raisins or a pinch of cinnamon wouldn't be out of place, nor would a potato or green peas. It is what you make it. I think this would be a nice surprise as a brunch dish served alongside some fresh baked naan or papadums and a hearty helping of upma. Toast curry powder in a medium skillet over medium-high heat. Add the oil, bring it up to temperature, and then add the onion. Cook onion in oil until soft. Add the remaining vegetables. 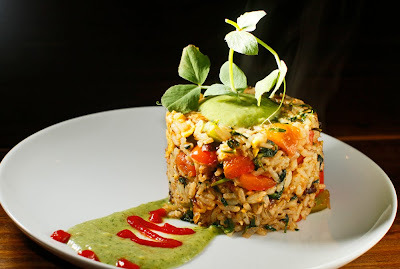 Cook another minute, and then add the rice; stir to coat rice and incorporate the vegetables. Add the cilantro and zest. Salt to taste. We made these tonight, and they were amazing. Looking into this recipe would definitely be worth your time this week! What's on your chili is certainly as important as what's in it. 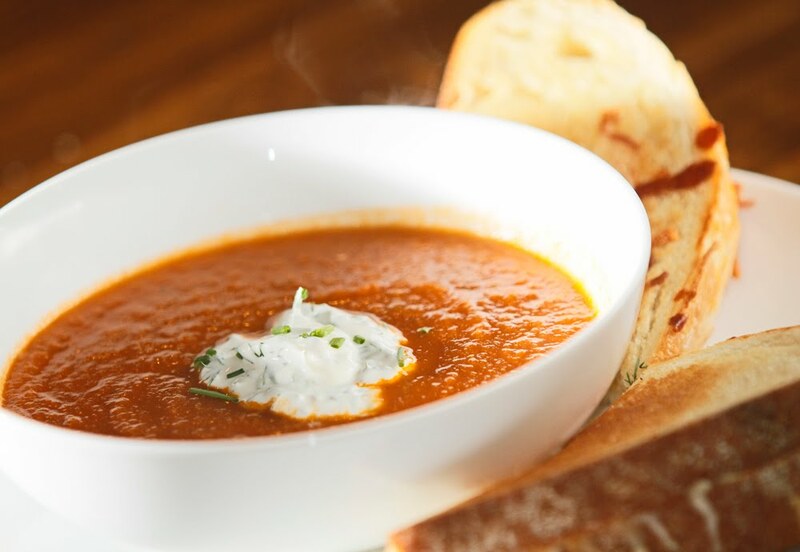 For me, what's up on top has got to be a little over-the-top, because it makes every bite of chili different by adding an element of creaminess, richness, or crunchiness to every spicy spoonful. Though chili is thought to be an American invention, I like to take a more Mexican approach to the garnish. I almost can't eat chili without guacamole; it just doesn't seem right without it. Sour cream (or mexican creama), sliced green onions, and fresh cilantro are also a must. Queso fresco (or feta) adds a nice bit of richness and saltiness to the dish, and the thinly sliced radishes are bright and crunchy. 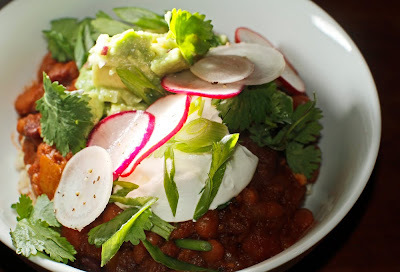 Make a big pot of vegetarian chili and then go all-out with your own toppings. Rinse the chopped onion in cold water to get rid of any astringent onion flavor. Peel and dice the avocados and place them in a medium bowl. Add the remaining ingredients and stir. If serving this as a dip, add one peeled and diced tomato along with a handful of chopped cilantro. Thinly slice radishes using a mandolin or sharp knife. 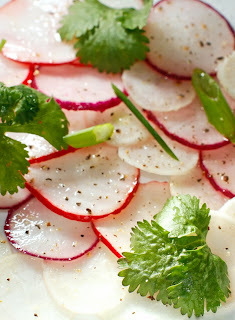 Mix the lime juice and the agave syrup together, and pour the mixture over the radishes. Season with salt and pepper. So...what do you like to eat on top of your chili? Where? Where? I don't see any mushroom ketchup! Well, that's because it's ugly. It's there hiding behind the beautifully cooked tofu slices, next to the fresh arugula and sliced tomato. Look closely...there you go. It looks like mashed black beans...or maybe even mud. The taste, however, is a whole different story. It's wonderfully rich, sweet, smooth, and tangy. The closest thing to the flavor would be worcestershire sauce; these two do share several ingredients like shallots, garlic, sugar, and vinegar. The mushrooms in this recipe add a whole new layer of savory-ness to some of the foods you already love: sandwiches, soups, chili, fries, and burgers. Hedgehog mushrooms cannot be cultivated like cremini or shiitake, so whenever you find them at the market, they have been foraged or picked from the forest floor. This buff-colored mushroom gets its name from having soft quills that look like a hedgehog, not gills like many mushrooms. Their light but complex flavor is similar to that of a chanterelle with hints of wood and peat, but their texture is far less dense and chewy. All of this makes the hedgehog mushroom a rare and unusual treat. There is a simple trick to preparing most fresh, wild mushrooms: you want to cook them fast and hot to sear the skin and warm the flesh. I learned this technique from watching chefs prepare delicate seafood like scallops and salmon. This cooking process takes only a few seconds on each side. Overcooked mushrooms can become tough and lose much of their nuanced flavor. At twenty dollars a pound, I want to get all I can out of each bite! First, clean the mushrooms with a damp paper towel to remove any dirt or debris from the stem, top, and bottom. Using a pair of kitchen shears, remove the stem and reserve it for use in a stock. With the gill side up, drizzle the mushrooms with a little bit of olive oil, sprinkle them with salt, and hit them with a touch of black pepper. Heat a medium skillet over hight heat and then add a few tablespoons of olive oil. Once the oil begins to smoke, lay the mushrooms into the pan gill-side-down and allow them to cook for 30-45 seconds. Using a pair of tongs, turn each mushroom once allowing the top side of the mushroom to cook for another 30 seconds or so. The texture will be slightly crispy at the edges and smooth in the center. 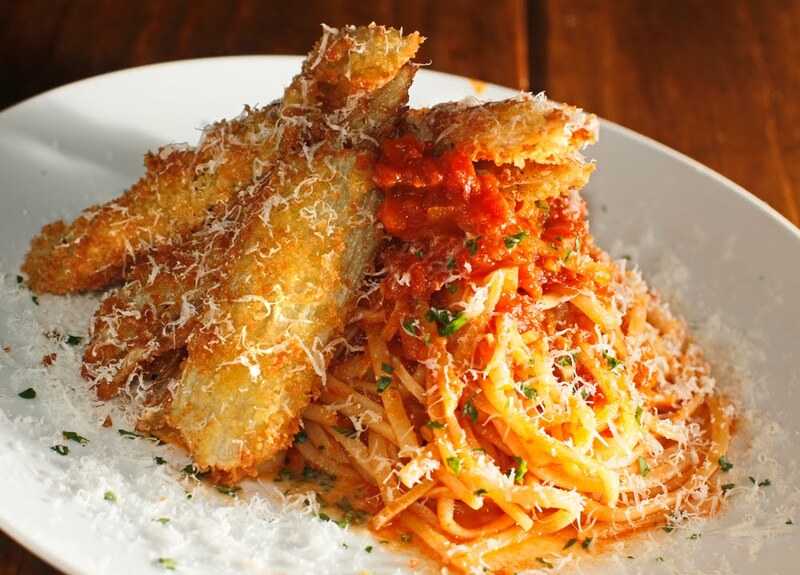 Serve on top of pasta, toast, or risotto with some crispy fried shallots. Bari is one of my favorite restaurants in Memphis. Think coastal Italian cuisine focused on traditional dishes from Southern Italy --- plus so many wonderful vegetarian options. This is no accident. Chef Jason Severs and his wife Rebecca often opt for meatless meals when cooking for their own family. 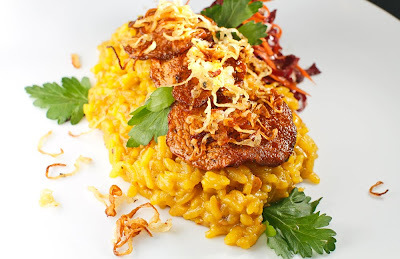 The couple even put on an all-vegetarin wine dinner at Bari last year. What a memorable experience! I typically start with eggplant fritters and fava beans to share, and then I move on to a grilled radicchio salad. 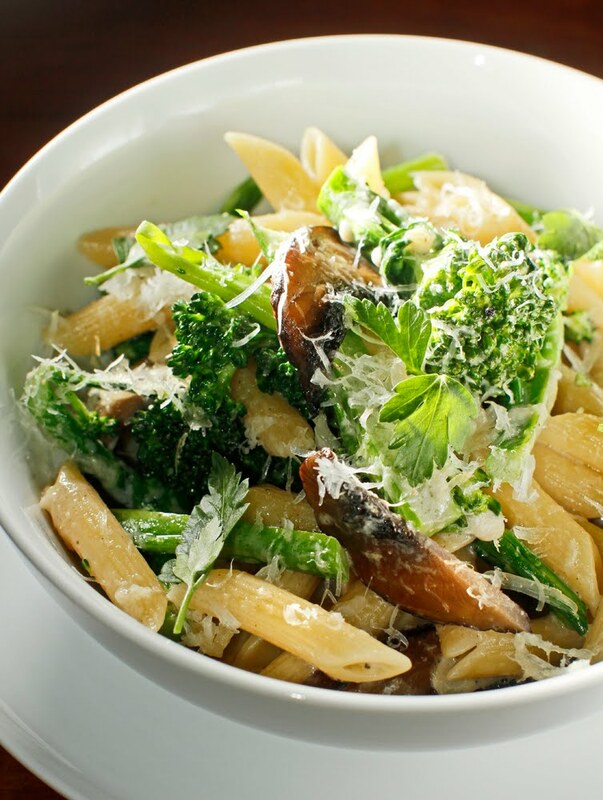 For my entrée, I almost always get the Pasta con Fungi, Broccoli e Formaggio di Capra. I know it sounds fancy, but it's as straightforward as you can get: a few good ingredients expertly prepared and served, which is representative of Jason's cooking both at Bari and his great new place on Broad Avenue, Three Angels Diner. 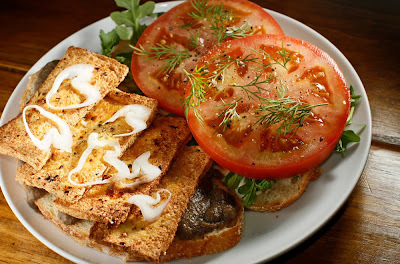 In a large pan over medium-high heat, fry the slices of mushroom in olive oil until brown. (This is best done in batches.) Remove mushrooms and set aside. In the same pan, cook garlic until lightly browned, and then add the lemon zest, white wine, and some cracked black pepper. Reduce the wine by half, and then lower the burner to medium-low. Add the milk and cream to the pan and allow that mixture to come up to temperature. Cut the broccolini into bite-sized pieces. Add in the mushrooms, broccolini, and the cooked pasta. Turn the heat off and add most of the cheese reserving some for garnish. Stir until the cheese has melted into the sauce and the pasta is coated. Serve pasta in a warm bowl. Garnish with parsley, grated cheese, and tiny drizzle of good olive oil. This is one of those happy accidents that comes from having stuff on hand, playing around with it, and surprisingly making something good out of a bout of sheer curiosity. Soak the cherries in the brandy for at least 2 days in the fridge. Add this to a saucepan along with the sugar, the orange's juice, sugar, and salt. Heat it on medium for 20 minutes or so until reduced. Cool and then blend it to a smooth consistency. 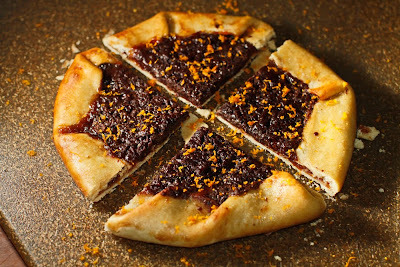 Keep for up to a week in the fridge and have it on your morning toast or with ricotta French toast sandwiches...or do as we did and immediately pour it into a chocolate-cherry tart with orange zest. All my little brother wants for his birthday every single year is homemade peanut butter cups. 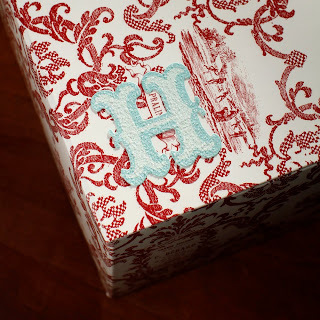 He issues the usual kingly demand for them mid-January; he knows we will acquiesce and bring him a little box of them on his day. Put the foil muffin liners into the 12 tins. Mix the first 5 ingredients well and pour the peanut butter mixture evenly into the 12 cups. 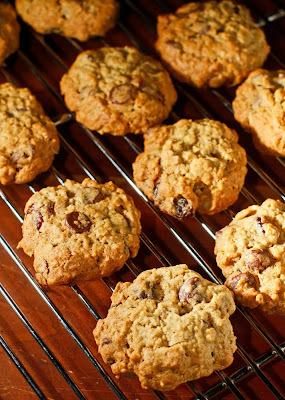 Heat the chocolate chips and the soy milk until just melted. Let it cool a bit and then spoon it over the prepared cups. Tap or shake the muffin tin so the layers settle. 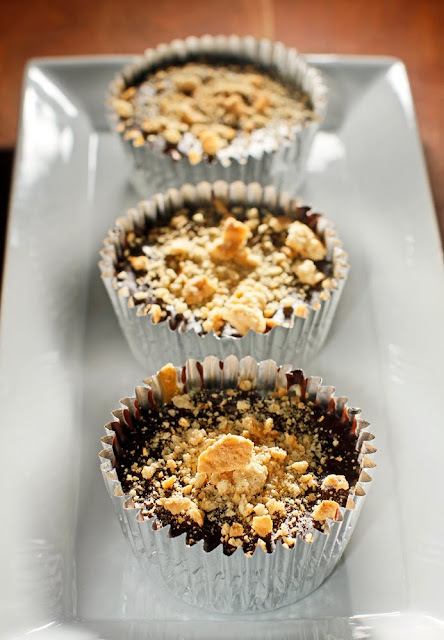 Sprinkle graham cracker crumbs or chopped peanuts over the top of the cups. Refrigerate for 6 hours or freeze for 1-2 hours before serving. An unbelieveable box of apples (from here) appeared at work as a gift for us to share. 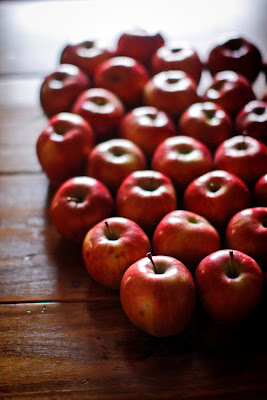 I grabbed a few every day, and soon, the towering pile of apples on my desk grew into a spectacle. Why didn't anyone else covet these apples? I for one was super-happy to squirrel them away. Personally, I love lucking into a huge amount of a raw ingredient because then I get to while away time processing it as well as dream about all the things I can cook up. 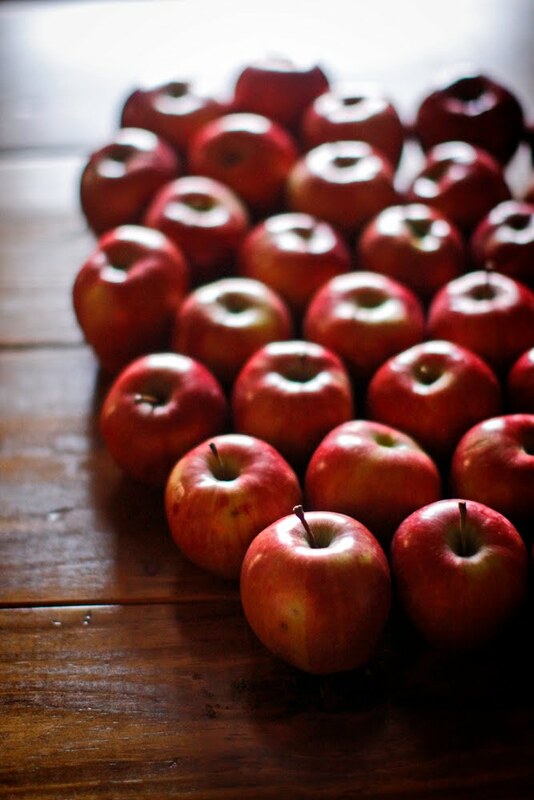 So what should we make this week with 35 free, pretty, shiny apples? Any suggestions? 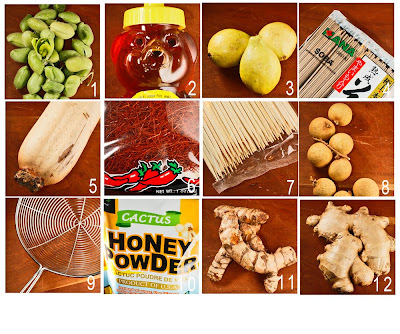 Why ever would you want to take on the task of making your own vegetarian broth? Well, it's fresh, it's better than anything in a can or a carton, and really, it's not that hard. The process is simple: use a food processor to allow the maximum amount of flavor to be extracted from the veg in a minimum amount of time. Then boil. Strain. Simmer. Done. Soups taste so much better this way. 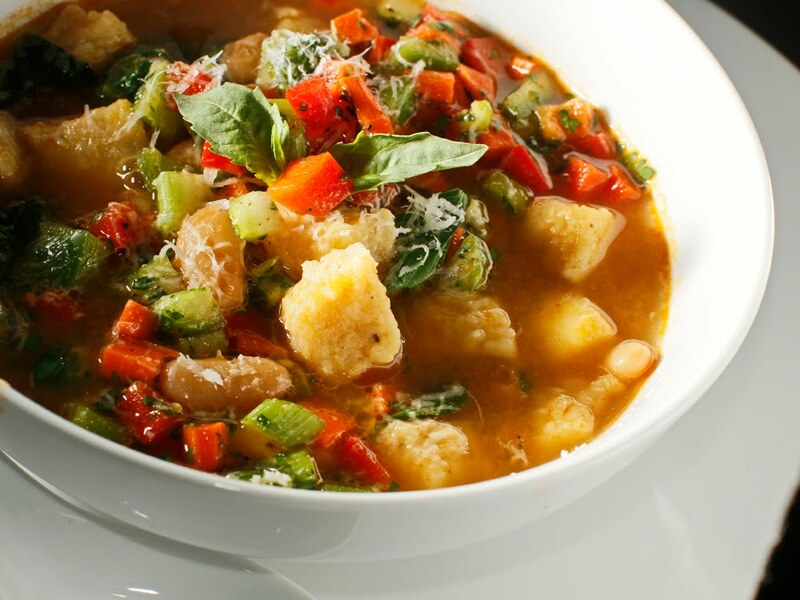 This broth is great in tomato sauce, curries, grits, and beans as well. You can make a big batch of this broth, use some, and freeze some until you need it. Sauté the chopped onion in olive oil and on medium-high heat until it's translucent and starting to brown around the edges. In batches, process all the vegetables and garlic. Put all the veg and garlic, herbs, miso and pepper in, and then fill your soup pot with water to about 2 inches from the top. Squeeze the lemon halves into the pot and then drop them right in. Bring it all up to a boil. Simmer for 20 minutes. Let it cool and then strain out the veg. Return the liquid to the soup pot and reduce by half on medium-high heat. Season with salt to taste. *A variation on this is to add 12 ounces roasted or dried mushrooms; this will make it more 'beefy' and savory. The mystery ingredient: fresh chickpeas. They have them at the Winchester Farmer's Market right now, and may I suggest you go grab a few handfuls. The fresh ones, as opposed to the dried or canned kind you normally find, have a sweetness much like English peas, they are bright green with a hearty texture. They were such a wonderful a treat that now I know I'll pick them up any time I spot them. 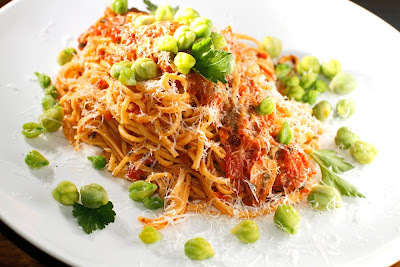 I paired the fresh chickpeas with roasted red peppers and garlic to create this sweet and smoky pasta dish. If you wish to make the pasta follow these simple instructions, then just cut the pasta sheets into strips using a pasta roller or a pizza cutter. Bring a large pot of salted water up to a boil. Blanch the chickpeas for 20-30 seconds or until they start to float. Remove and set aside. Cook pasta then transfer the noodles to the pan containing the red pepper sauce. Toss noodles in the sauce. Divide noodles between two plates and garnish with chickpeas, parsley, and parmesan. I love, love, love the Winchester Farmer's Market which is located at the corner of Winchester and Kirby across the street from the Statue of Liberation through Christ, a Memphis landmark. Every time I go there I end up with all kinds of cool food from all over the world...some of it I had never seen before, and some of it I'd never even heard of before. I believe in eating local most of the time, but I also believe that you have to take the opportunity to try new and different foods when you can. The first time I ever had rambutons, dragon fruit, ponzu, and fresh sugar cane, it all came from the Winchester Farmer's Market. They have fresh vegetables, herbs, and spices you can only find dried in other supermarkets. It is such a fun place to go and explore. They even have someone making fresh tortillas in-house. You're sure to find something you can't live without. Leave me a comment and see how many items from my latest haul you can name. Some of them are easy and others...not so much. Oui, oui, monsieur et madame...we had a French-inspired dinner tonight. French, I"ll admit, is not my best subject in the kitchen, but I think it's fun to try it. We had French onion soup (recipe to come) and a wonderful asparagus and egg salad that was so very simple. Mix diced tomato with a tablespoon of olive oil, a pinch of sugar, the juice from 1/2 a lemon, a pinch of salt, and some cracked black pepper. Blanch peeled asparagus in some super-salty water (slightly saltier than sea water) for about 3 minutes. 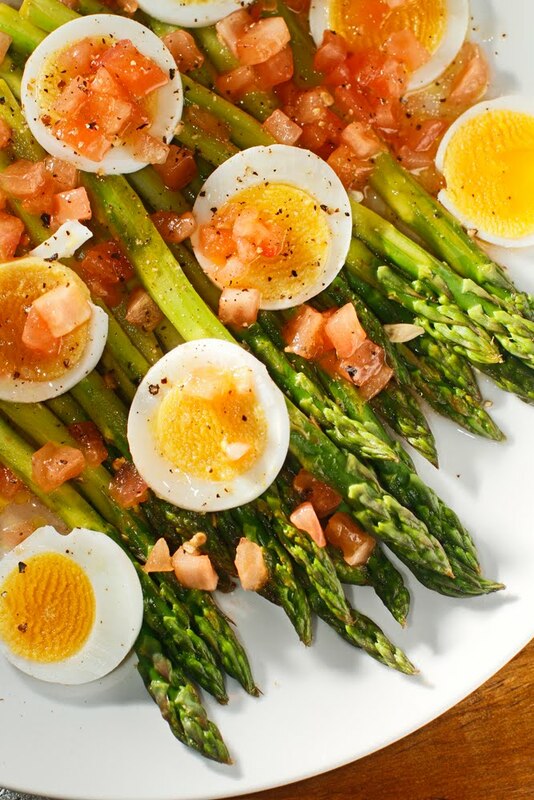 Place asparagus on serving platter, arrange slices of hardboiled egg over the top, and then garnish with the dressed tomatoes. Finish the dish with a pinch of salt and a little cracked black pepper. I didn't just put two crazy words together to get your attention, I swear. Honestly, this has become one of my favorite things to make. I think it would be great for a party since you can prepare everything ahead of time and then just stack it on the plates. With the salty kick of the olive tapenade and the deep flavor of the roasted vegetables, you get immense complexity. The balsamic reduction pulls it all together and turns up the volume of the whole dish. The nicest thing about this recipe is that you can take any of the components on their own (ratatouille, the balsamic reduction, the kalamata tapenade) and use them in another dish. For instance, the tapenade would be great on a cheese plate, and the balsamic reduction would be perfect on a caprese salad. But first, try it like this; I know you'll love it. Spread ingredients onto a large rimmed baking sheet, drizzle with a few tablespoons of olive oil and balsamic vinegar, sprinkle with salt and pepper, and bake at 400 degrees for 15-25 minutes or until the vegetables start to caramelize on the edges. Remove and allow the vegetables to cool. Stack the sheets of phyllo pastry drizzling a tiny bit olive oil between every other sheet. Using a pizza cutter, slice puff pastry into 2"x2" squares. Using an ice cream scoop, transfer the ratatouille to half of the phyllo squares. Bake squares in a 400 degree oven on a rimmed baking sheet for 25 minutes. 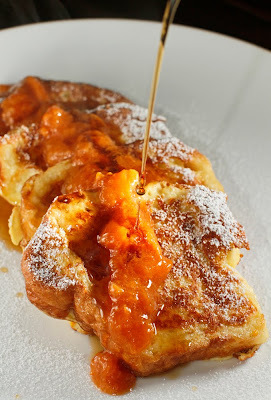 Reduce mixture over medium heat until thick and syrupy. Over medium-high heat, sauté shallot, garlic, and oregano in olive oil until soft and cooked through. This should take just a few minutes. In a food processor, blend the olives with the garlic mixture until smooth. 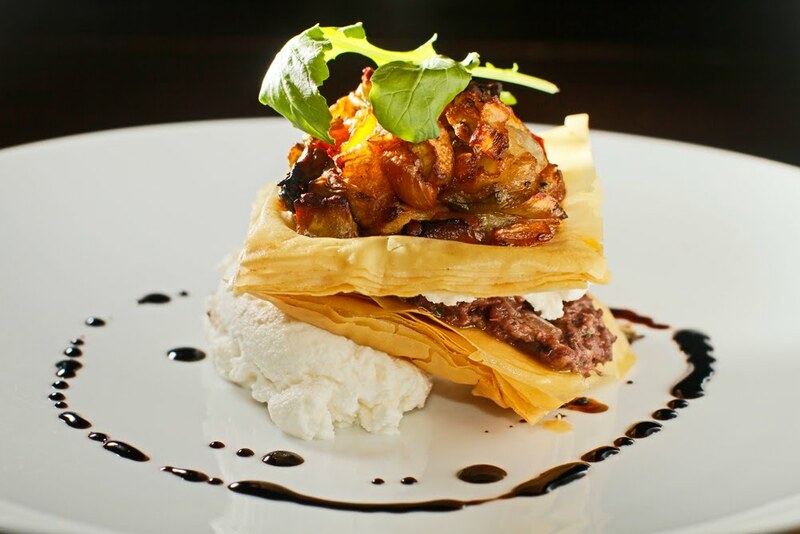 To serve, place a spoonful of your favorite soft cheese (ricotta or goat cheese) in the center of the plate, stack a phyllo dough that has been slathered in tapenade on top of the cheese, and finish the stack the ratatouille and phyllo. Finally, drizzle the reduction over the whole thing. *Apothic Red was a really good match for these strong flavors. So of course during this weird week of sub-freezing Memphis temps, just to dream, we decided to play pretend-vacation and make a key lime tart: instant summer. And it took no time at all to make -- the crust has three ingredients, and the filling only has four. Crumble the wafers in a food processor or smash them in a bag using a rolling pin. Mix in sugar and melted margarine. Press into pie pan and bake for 5-7 min. at 350. Remove from oven and let it cool. Whisk all ingredients together until smooth and pour into pie crust. Bake at 350 for 30 min. Let it cool and then put it in the fridge for a couple of hours before serving. 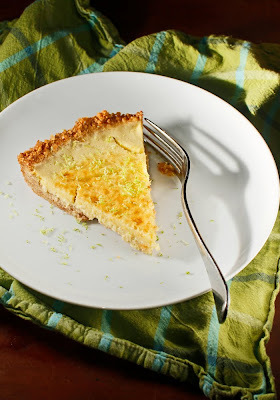 You can top it with finely grated lime zest. Well, the unlikely Southern snowstorm has passed, and we are not leaving until the roads are clear. It's nice to have a moment on a usually hectic Monday morning to stop and have a good breakfast. I was inspired to make this incredibly light egg dish after the wife requested a cheese-less omelette, no doubt a reaction to the rich truffled mac n' cheese we had for dinner last night. This airy omelette is a great dish to make if you're too intimidated to try your hand at making a soufflé. Many of the steps are the same, but there are fewer of them -- and it is decidedly less fussy. 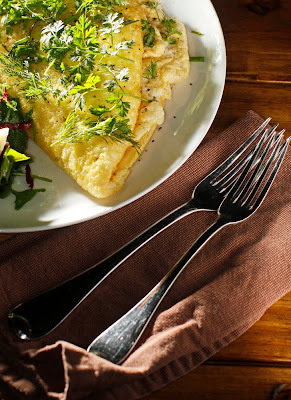 Like a normal omelette, it can be topped or stuffed with nearly anything. I decided to continue with the 'light' theme and top it with only fresh herbs. On the side is an arugula, radicchio, and apple salad with a honey-sweetened champagne vinaigrette. A perfect brunch on a very Sunday-seeming Monday morning. 350 degrees. Place egg whites, water, and cream of tartar into the bowl of your stand mixer and attach the whisk. Beat egg-white mixture on high for about a minute. (Mixture should be white and about four times the original volume.) At this point, add the yolks, a pinch of salt, and black pepper. Turn the mixer on to incorporate. Now remove the hot pan from the oven and add a tablespoon of olive oil. Using a silicone pastry brush, coat every surface of the pan. Pour the egg mixture into the pan and return it to the oven for 9-10 minutes. (You will know it is done when the top is lightly golden.) 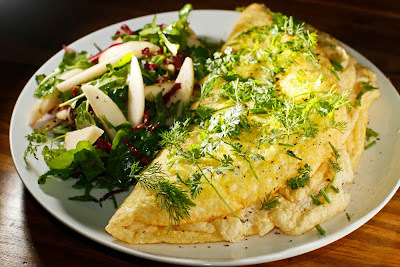 Remove the pan from the oven and shake the omelette to loosen it from the pan. It shouldn't stick. Flip one side onto the other and slide it onto a plate. Top with herbs and serve with a small salad. Cook pasta in plenty of salted water. Reserve 1 1/2 cups of the pasta water for a later use. Place spinach, parsley, garlic, lemon zest, walnuts, olive oil, salt, and pepper into the food processor. Pulse until everything is incorporated into a bright green paste. Once the pasta is cooked, drain water off and add the pesto to the pasta. Add enough reserved pasta water (about a cup) to the mixture to create a sauce. Combine all ingredients -- save for the feta -- and allow it to marinate for a few minutes. 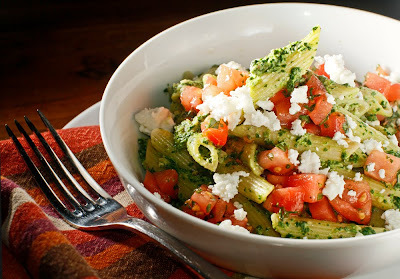 Top portions of pesto pasta with tomatoes and crumbled goat feta. 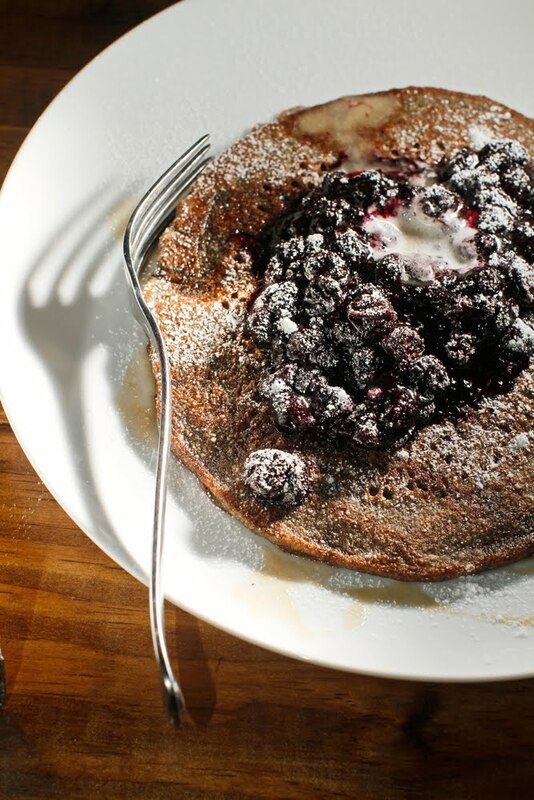 On the weekend, pancakes are unavoidable. There's something about a leisurely Saturday or Sunday morning that just calls for a pancake breakfast that you sit down to eat as a counterpoint to the usual weekday breakfast bars, gulped bowl of cereal, or sad-and-rushed nothing at all. This recipe is more akin to a quick bread than a pancake. I adapted it from the back of the Bob's Red Mill whole grain buckwheat flour package by adding a few frills like orange zest and vanilla for flavor and using rapid rise yeast so these didn't have to sit overnight. They're vegan, they're pretty healthy, they're hearty, and best of all, they taste exactly like fresh wheat bread with warm jam. Mix dry ingredients, margarine, zest, and vanilla. Add the water and stir to incorporate. On a buttered griddle over medium-low heat, cook each pancake until golden; this should take about 2-3 minutes per side. Plate them and add maple syrup, powdered sugar, and the following simple blueberry sauce. Put blueberries in a saucepan with juice and sugar and cook on medium heat. Stir occasionally and cook down for 10-15 minutes. You may have seen cardoons in the grocery store and passed them right by because they look a lot like celery from a distance. Upon closer inspection, you may notice some differences. For starters, cardoons have thorns on either side of each rib, they are lighter in color, and they're slightly larger than most stalks of celery. Cardoons are, in fact, a close cousin to the artichoke...which explains their thorny exterior and also their wonderful flavor. Once you go through the laborious ritual of preparing cardoons -- clean, peel, soak in acidulated water, blanch in salted water, cool, dredge in flour, dip in egg, roll in breadcrumbs, and fry -- you will discover that they are a wonderful treat that's worth every bit of the effort. The stalks taste similar to mild, creamy artichoke hearts. This is an Italian delicacy traditionally served at Christmastime, but I prepare them whenever I spot this elusive vegetable at the grocery store. Clean and trim the root-end and tops, including the leaves, from the cardoons. (Mind the thorns! You may want to wear gloves.) Using a vegetable peeler, peel any tough strings and thorns from each rib. Cut prepared cardoons into thirds and soak in enough water to cover. Squeeze a lemon into the water and set aside for 15 minutes. 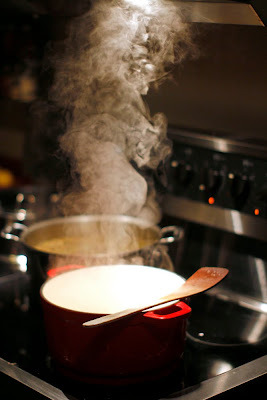 Bring a separate pot of heavily salted water (it should taste like the sea) up to a boil. Blanch the cardoons for about 8-10 minutes or until soft. Remove from the water, and allow the cardoons to cool. Set up a three-pan system with flour, egg, and panko. Take each cardoon through these steps: first dredge it in flour, next dip it in egg, and finally, roll it in the panko. Heat about an inch of canola oil to medium heat in a medium-sized frying pan. Fry cardoons in batches until golden brown. (This will only take about a minute per side.) Drain on paper towels, sprinkle with salt and pepper, and garnish with parmesan. This is perfect served with a simple pasta with tomato sauce. Chilaquiles have become a favorite in our house. I make them slightly different every time, but the basic ingredients are the same: tortilla chips, eggs, onions, peppers, tomatoes, and cheese. My buddy Michael has a wonderful version in which he tosses the chips with salsa and serves fried eggs on top. Sometimes I serve it over spicy roasted sweet potatoes. There is no right or wrong answer here, just abundant deliciousness. This dish has edged out migas tacos, which is a strikingly similar scrambled eggs dish, in recent months as our go-to, easy, can't-fail dinner. Preheat oven to 400 degrees. Toss potatoes in a few tablespoons of olive oil, and then add the chili and garlic powder. Place potatoes in a single layer on a baking sheet, and place into oven for 20 minutes or until the edges of the potatoes start to brown. Season with salt and pepper. In a pan over medium-high heat, sauté onions and peppers in a few tablespoons of olive oil until the onion is translucent. Add the tomatoes and peppers to the mix; cook until most of the liquid has evaporated. 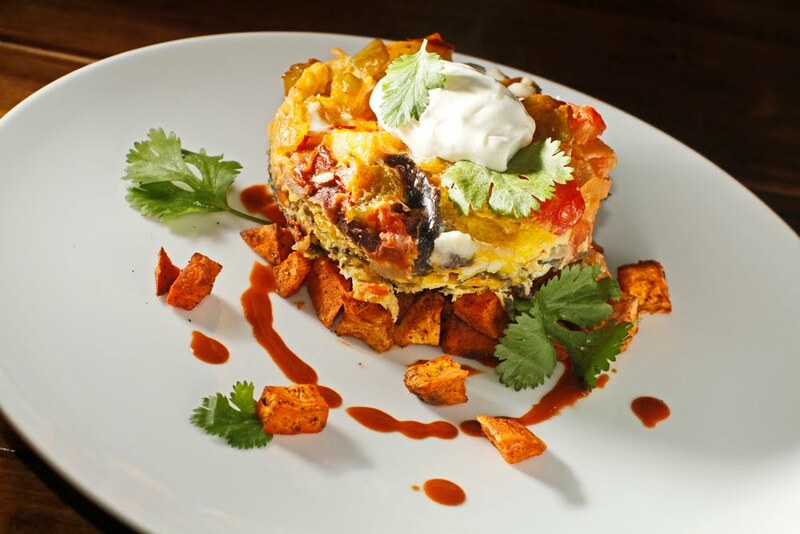 In a medium baking dish, place one handful of tortilla chips so that they cover the bottom of the dish, pour in half of the eggs, and add half of the vegetable mixture. Repeat. Top with goat cheese, and place into a 400-degree oven for 20 minutes or until the eggs are set. 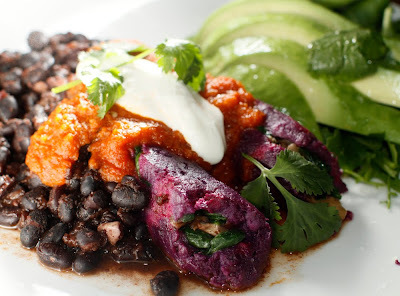 Serve chilaquiles over the sweet potatoes. Garnish with cilantro, hot sauce, and sour cream. 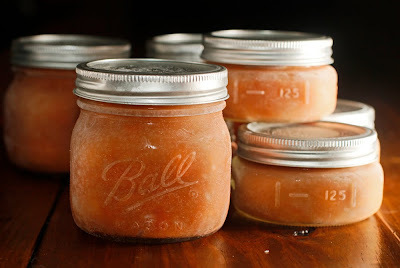 I used to think making freezer jam was for wimps. Typically, I'd rather can something for real, but it turns out that the canning expert in my family was abysmally uninterested in spending an afternoon sterilizing jars, boiling fruit, and testing seals. So when we all picked persimmons from my brother and his wife's massive tree this December, I went ahead and peeled and sliced my share of the fruit and froze it until the time was right to deal with it. On New Year's Day, I started jamming. The directions inside the box of pectin led me through the freezer jam process and spelled out the ratio of fruit to lemon juice to pectin I needed to use. 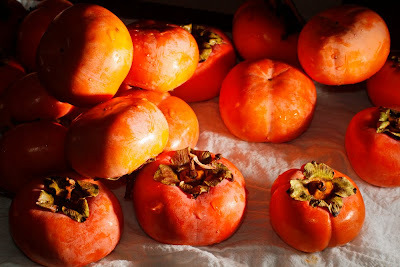 I boiled, mashed, and then reduced the persimmons, added Cassia and also Vietnamese cinnamon plus lemon juice, brown sugar, a pinch of salt, and the pectin, and very soon, I was ready to fill up the jars. The freezer jam process is very laid-back, which is relaxing compared t0 all the details of proper canning, but the only drawback to this little shortcut is that you can't leave your jars of jam out at room temperature or give them away with no worries about them spoiling. The finished jam just stays in the freezer until you are ready to thaw it in the fridge, where it can be kept, opened or not, for a week. The Jack LaLanne Power Juicer Pro has been one of our favorite gifts. We have been experimenting with it and coming up with some healthy, potent juices like apple-carrot-spinach and clementine-ginger. 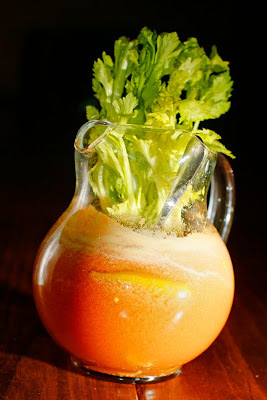 It wasn't long before I was looking for a more sinister use for the juice, and that is when I came up with an idea for a juicer bloody mary. It was the perfect companion to the black-eyed peas, greens, and cornbread at my younger brother's New Year's Day party. Frankly, the jury was split on this one. My older brother said they were the best bloody marys he had ever had, and of course, I'd have to agree. Because everything is fresh, my version of this venerable brunch beverage tastes light and clean when you compare it to the thick, preservative-heavy mixes you find at the store. A few at the New Year's Day party found this to be too spicy, but I think that says more about them than it does about my mary. Try this recipe for yourself with or without the vodka. Rinse the vegetables and the limes. (No need to peel if you have a powerful juicer.) Juice them up and pour into a pitcher. Add the sauce, paste, salt, and pepper and stir. Serve over ice. Add vodka if you like and garnish with pickled okra and celery tops.